In their last catalog, the Israel Coins and Medals Corporation, the exclusive manufacturer and distributor of coins and medals issued by the Bank of Israel, announced the “Jerusalem of Gold” bullion coin series, an annual series that will depict famous Jerusalem landmarks. The coin will contain one troy ounce of .9999 pure gold and will have a face value of 20 New Sheqalim. There will be a maximum mintage of 3,600 coins. According to the ICMC catalog, “The coin will bear a roaring lion with a beautiful curved tail, take from a 2,800-year-old ancient seal dating from the 8th century BCE, discovered in archeological digs at Armageddon (Megiddo). The roaring lion is the symbol of Jerusalem and the Kingdom of Judah and it has appeared on Israel circulation coins, the 5 Lira Coin of 1978 and the Half Sheqel Coin of 1980. 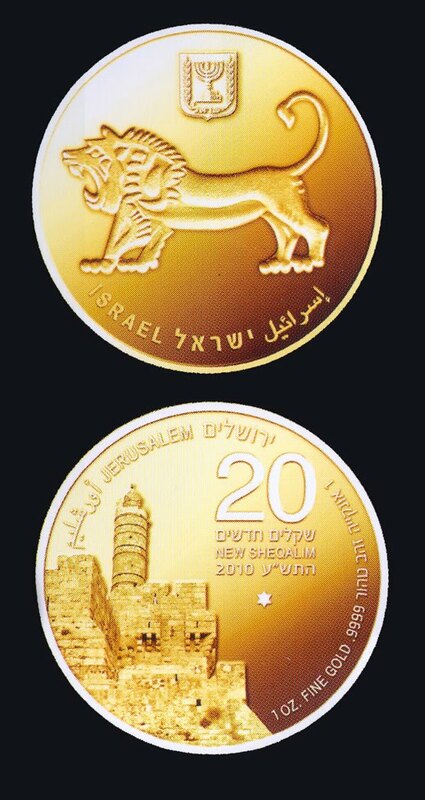 Coins are schedule to be released on Jerusalem Day, May 12, 2010. The price was not provided in the catalog. Image courtesy of the Israel Coins and Medals Corp. scanned from their catalog.